Is this Meteor bar, a Dollarama version of the classic Mars, even halfway decent? I have a few personal rules about dollar stores. While some things are worth picking up at the local dollar emporium – stickers, crafty things for kids, party junk, any other kind of junk – I have typically stayed the hell away from 1) anything that involves electricity, and 2) unless it’s a guaranteed brand name, food products. I could pretend to be all counterculture and not care about brands, but when it comes to food, I have a well-earned trust for the brands I know and buy regularly. Even cheap-o store-brand foodstuffs have to meet the quality standards of the grocery chain selling them, since they’re not going to stake their reputation on something sketchy. (Flavour? That’s different. But even if it’s gross, it should still be safe.) If I want cheap food, I buy reliable brands from Superstore or No Frills, or stock up on big quantities of non-perishable tinned/packaged stuff at Costco. All it took to flip my distrust into curiosity was the insane price: $0.50 for a bar considerably larger than a standard Mars. To make a sport of it, I thought I’d sample it next to a genuine Mars bar for the sake of comparison. 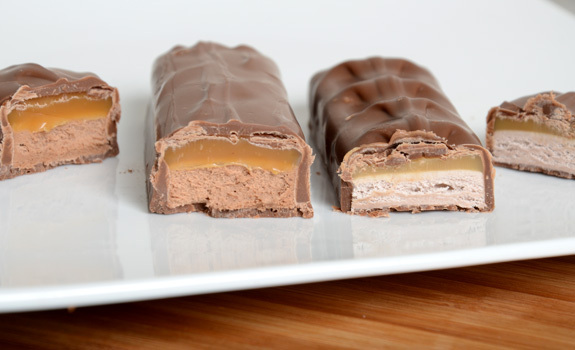 The Mars bar on the right is softer and fluffier, with a tender, forgiving nougat and caramel core. The Meteor, on the left, is less pretty to look at and requires a bit more chewing. Cost: I paid $0.50 for the 72-gram Meteor bar I bought at Dollarama in Edmonton, and $0.77 for a 52-gram Mars bar at the same Dollarama. The Meteor bar looks deceptively big because there are two bars in the package, though the Meteor bars aren’t as thick as the Mars. Availability: Mars? Everywhere. Meteor? Dollarama. But there’s no lack of those in Canada, if you know where to look. Product of: Turkey (Meteor). Canada (Mars), I think. (It’s not explicitly spelled out, but the wrapper notes that, while this bar is peanut free, other Mars bars made outside of Canada may contain peanuts.) Of course, in my mind, Turkey is associated with Turkish delight, which gives it ample confectionary cred. Taste: Without anything to compare it to, the Meteor doesn’t taste bad at all. It has lots of sticky caramel sweetness and chewy (if somewhat tough) nougat that isn’t too dense or too soft. The Mars bar is far softer, with a sweetness that builds instead of hitting all at once. The Meteor’s sweetness turns into a near-burning tingle in the throat after a couple of bites. Also, the Meteor’s flavour is more obvious (for lack of a better term), while the Mars takes more time in the mouth to develop. 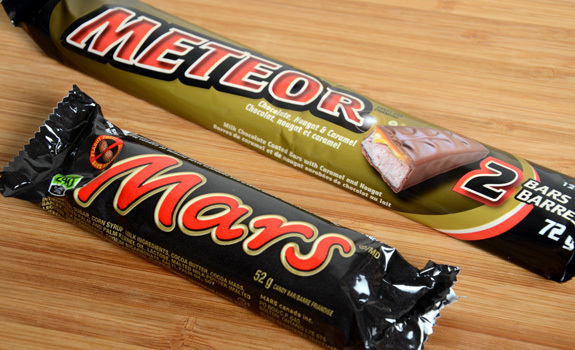 The chocolate in the Mars tastes better than the Meteor’s, but not by a wide margin. Tasting them blind, I’d probably identify the Mars as the premium bar, mostly because the texture feels fancier, and because it doesn’t have the cloying, artificial vanilla note that the Meteor has. One certainly tastes cheaper than the other. Still Alive? : Yes! I’m still here, typing this. The verdict: The Meteor bar was far better than I expected. Is it better than the Mars? No. Is it a satisfactory snack worth the paltry $0.50? Yes, indeed. I think there may be some mix up on the photo. The Mars bar is on the left and has the darker fudgier nougat. The Meteor is on the right and has more of a traditional nougat appearance at least from the ones I have tried. Having tried both, Mars wins hands down for me. Fudgier, better caramel and the chocolate coating is by far superior to the Meteor bars I tried. The Meteor was almost sickeningly sweet a couple of bites in and my teeth were protesting in short order. I don’t have that problem with a Mars. Personally, I would spend the 27 cents and get the better bar! I respectively disagree, I think the Meteor bar actually tastes slightly better than the Mars bar at lEast in BC. I belive shelf life may have something to do with that.